British Airways sent me an email a few months ago with the teasing subject line, “Want to know how many miles you’ve flown with us, Dr Rogers?” I was intrigued and clicked on the link. It sent me to my very own dashboard letting me know how many miles I had flown since joining the BA frequent flier club. 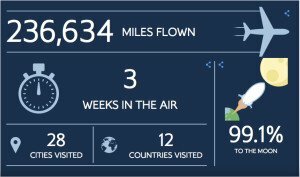 The email also proudly announced, “it’s a celebration of your life in the air with British Airways.” However, it just made me think, wow, I travel too much. I immediately wondered and worried what that makes my carbon footprint like – bigger than Bigfoot’s even? Not only does it show me the total number of miles I have flown but also how many weeks I have been in the air (three!) and how many cities and countries I have been to. I looked at it in horror and then quickly squirreled it away, shocked at how much travelling I had done rather than celebrating it. But then, a few weeks ago, I found myself looking at the link again – more intrigued than guilty this time, to see how much more I had flown in the last few months. Dashboards have become an increasingly popular form of information visualisation, serving up slices of data for all manner of things, from health to business trends to the pulse of a city. 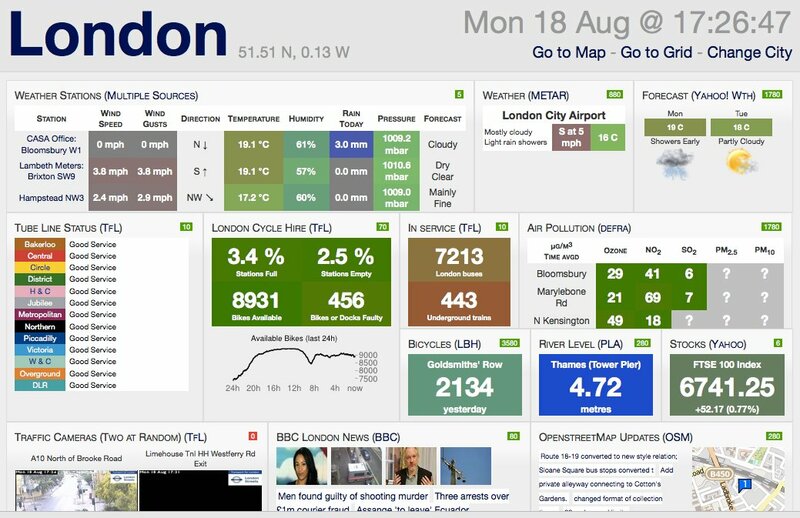 For example, the London City dashboard shows portals of data side-by-side from multiple feeds. Health and well being devices, like FitBit, Nike Fuel and Jawbone Up have tailored their dashboards towards the individual, using an assortment of gauges, bar charts and pie charts to make it easy to see how well the wearer has done that hour/day/week, and whether they have met their targets. 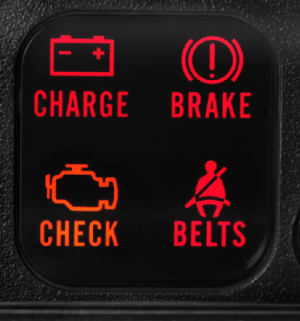 By themselves, the graphical components of most dashboards are relatively easy to read. However, collectively, many of them have been designed with poor visual design by software vendors who “focus their marketing efforts on dazzle that subverts the goals of clear communication” (Few, 2013, p2). The result can often be a hotch-potch of graphs and tables making it difficult to know where to find something or how to compare data over time or multi-dimensions. The holistic design of a dashboard needs to provide a digestible and legible slice of information that is thoughtfully laid out in a spatial manner and intuitive to the user when first looking at it, drawing their attention to anomalies or unexpected deviations from the norm. This involves thinking about how best to combine and contrast the different elements. So, which is the easiest to read – BA or London City? Which is the most aesthetic and informative? What piece of information stands out the most? 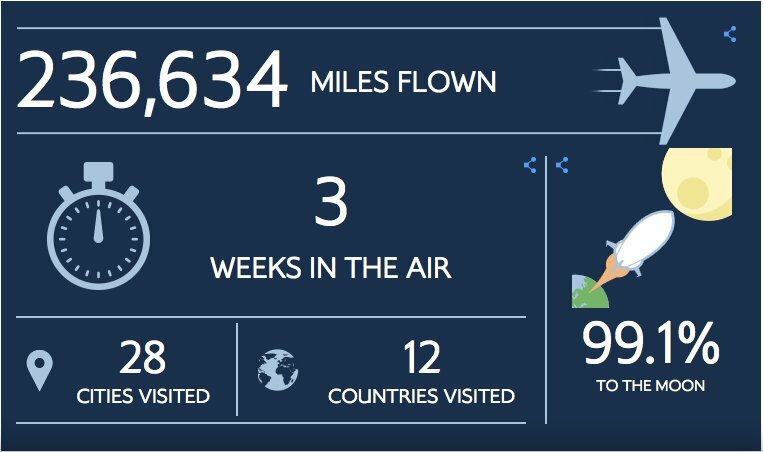 The BA dashboard has much thought gone into its visual design and the pictograms that have been selected instantly drew my attention. Noticing I have flown an enormous number of miles and that I have been in the air for nearly a month is truly shocking. What the BA dashboard does not tell me, however, is how long I have been a member of the BA frequent flier club. That requires more digging of the data. If I had only joined last year the dashboard of factoids would be really scary but it has been many years since I joined them – so maybe, all things considered, it is not so bad. The piece of information in the lower right hand corner also adds a bit of humour. 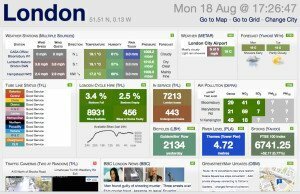 In contrast, the city London dashboard, developed by some colleagues of mine from UCL, provides much more information about transport, the current level of service on the various London Underground lines, the weather, news headlines, cycle hire capacity, weather forcast and more. At first glance, it seems incredibly busy. But after studying its form, the spacing between the blocks of information makes it easy to break it down into its components. After a few times looking at it, I can begin to make more sense of it, and see which parts I might be interested in so I can quickly glance, for example, at how bad the traffic is or what the air pollution is in Bloomsbury. 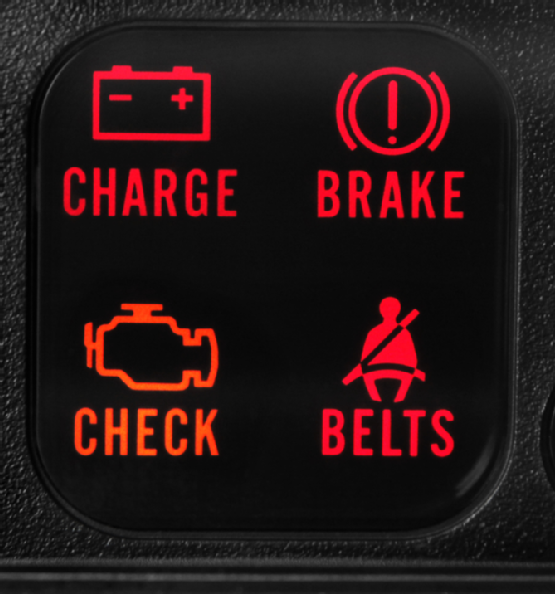 But all very different from the car dashboard that makes you turn into a cold sweat when the warning lights suddenly come on indicating a full-on failure, or simply some faulty electronics. Who knows which? Few, S. (2013) Information Dashboard Design: Displaying data for at-a-glance monitoring. Analytics Press.